Russian forces who used flame-throwers during the Beslan school siege last year will not face charges, a top Russian prosecutor has said. Deputy Prosecutor General Vladimir Kolesnikov was sent to the southern region by President Vladimir Putin last month to investigate the tragedy. Some of the victims' relatives say most died because of the firepower used in the Russian assault on the school. The hostage-taking raid by gunmen led to the deaths of 331 people. So far, the trial of the allegedly sole surviving hostage-taker and a separate parliamentary inquiry - both ongoing - have failed to explain the chain of events during the three-day siege of School Number One in September, 2004. Speaking in North Ossetia, Mr Kolesnikov said: "The actions of the military personnel were justified, and there are no grounds to open a criminal investigation." He also said the latest investigations had disproved claims that the militants hid weapons in the school beforehand and that the school principal collaborated with the hostage-takers. Mr Kolesnikov and his team have been questioning a number of high-ranking officials in connection with the siege. Relatives of the victims have accused Russia's top officials of bungling the rescue operation and of trying to cover up negligence on the part of the security forces. Mr Putin's decision to launch a new inquiry into the tragedy came after his Kremlin talks with the Beslan Mothers' Committee last year. Mr Putin promised an "objective investigation" and sent a new team of prosecutors to Beslan. 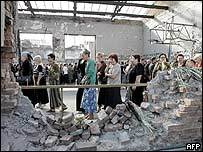 The Beslan Mothers' Committee claims that Russian flamethrowers, tanks and grenades had been used on the building while hostages had still been inside. Under pressure from the victims' relatives, another Russian Deputy Prosecutor General, Nikolai Shepel, admitted earlier this year that troops did use flame-throwers, following initial denials by the military. Many in Beslan view the new inquiry with deep suspicion as the new group represents the same organisation that has been investigating the tragedy for the last 12 months, the BBC's Steve Rosenberg in Moscow says. Separately, the parliamentary commission looking into the actions of Russian officials during the siege has interviewed hundreds of witnesses but is yet to publish its findings.